One of the oldest individual biological research stations in the U.S., the Huyck Preserve has supported research continuously since 1938 when the Biological Research Station was established. 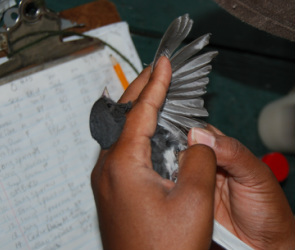 Since then, more than 200 scientists have carried out research projects at the Preserve. Among the distinguished scientists who have worked at the Preserve are Dr. Eugene Odum, regarded by many as the father of ecosystem ecology, and Dr. Donald Griffin, whose discovery that bats use echo-location to navigate led the military to the use of sonar. Preserve flora and fauna have been documented since 1938 and numerous long-term studies in ecology, animal behavior, systematics, biological diversity, evolutionary biology, and climate change have been conducted in the years following. A species list is available here. For more information on Research at the Huyck Preserve, please follow the links below. 1940’s & 1950’s - species inventories and ecological surveys by early career scientists including Eugene Odum, Normal Russell, Charles Kendeigh, William Hamilton, Pierre Dansereau, and Donald Griffin’s work on bat echolocation.